A diamond-winged Cartier tiara commissioned by the Duchess of Roxburghe will be displayed at Dundee's V&A Museum of Design next year. 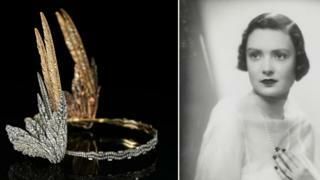 The tiara was created in 1935, the year of Mary Crewe-Milnes' marriage to the 9th Duke of Roxburghe. The Valkyrie tiara comprises more than 2,500 cushion-shaped, single-cut, circular-cut and rose-cut diamonds, set in a gold and silver frame. It will be the first time it has been displayed in public. Inspired by the winged helmets worn by the heroines of Wagner's opera cycle Der Ring des Nibelungen, the tiara is the last of its type ever made by Cartier. The pair of "en tremblant"' wings were constructed using wire-coiled springs so that they move slightly when worn. The tiara belongs to a private collector, and will be loaned to V&A Dundee, following arrangements negotiated through Sotheby's. It will be displayed in a section of the museum's Scottish Design Galleries. The galleries' lead curator Joanna Norman said: "This tiara is a stunning example of design being directly influenced by the person who commissioned it. "In 1935 the Duchess of Roxburghe had just married into a Scottish dynasty. 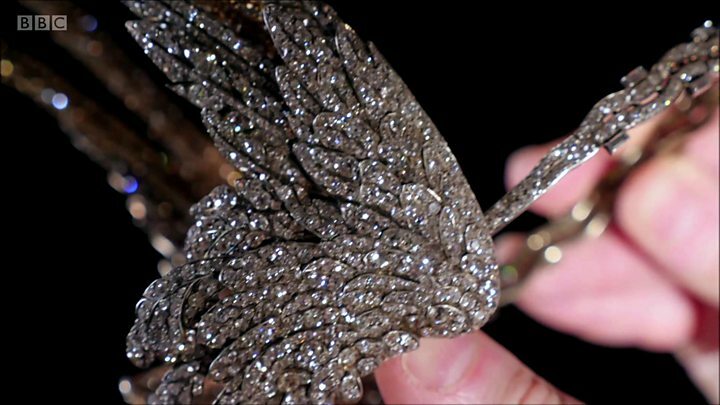 "When she asked Cartier to make one last Valkyrie tiara, she was commissioning a piece of exquisite craftsmanship and unexpected design, inspired by the fashions of her childhood." The fashion for Valkyrie tiaras originated on the stage before being rapidly adopted by fashionable aristocrats at the start of the 20th Century. The duchess's fondness for the style was sparked by seeing winged tiaras worn at balls and parties as a child. The £80.1m museum is due to open in the second half of 2018. The Scottish Design Galleries will feature about 300 objects, including items from a 15th Century book of illuminated manuscripts to the latest in computer gaming technology.